South Yorkshire based engineering company, Qualter Hall, is pleased to announce a record order book, worth in excess of £30 million, taking the company through to 2011. This is a particularly spectacular achievement in the light of the current global economic downturn. Qualter Hall was founded in 1860 and has a heritage in servicing the deep mining industry. Over more recent years, the company has diversified its core skills and now employs around 145 people dedicated to mechanical, structural, electronic, electrical and fluid power engineering. Operating through four main divisions; Mining, Hoisting & Transportation Systems; Mechanical Handling; Specialist Manufacturing and Ships Presses/Heavy Metal Forming Machines Division (Hugh Smith Engineering), the company has built up a renowned reputation for providing a unique service in the field of bespoke, turnkey project engineering both in the UK and Worldwide. 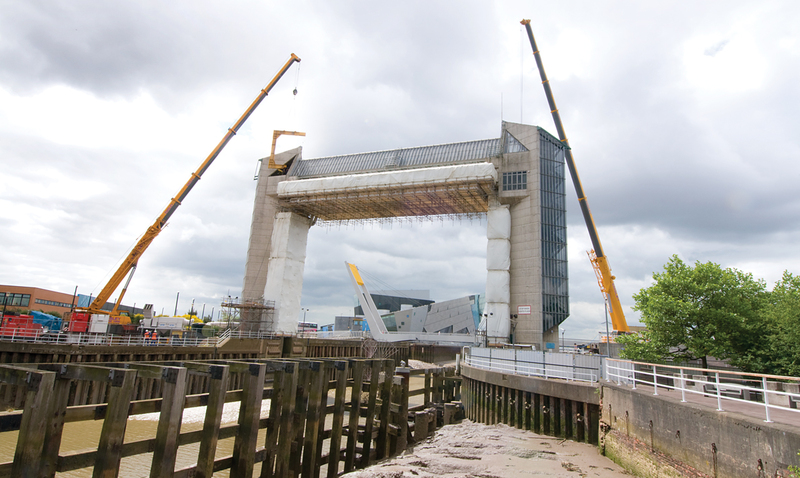 Qualter Hall were awarded the prestigious contract from the Environment Agency for the refurbishment of the Hull Tidal Surge Barrier, a vital Flood Defence, protecting thousands of properties in Hull and the surrounding area, from seasonal tidal flood events. The contract, with a value in excess of £5.5 million, is due for completion in 2010. Qualter Hall with its architectural partner, were the design competition winner with an innovative solution for a 57m span pedestrian Swing Bridge for Yorkshire Forward, an initiative with the objective of supporting the ongoing regeneration of the city centre. The bridge will connect the east and the west banks of the River Hull, while incorporating space for a restaurant within the bridge. The bridge will remain in permanent contact with the west bank of the River Hull, allowing pedestrians to walk on and off the bridge during rotation. A key feature in the award was the distinct form of a 'whale' which the bridge takes, making it an instant landmark, unique to Hull and its rich maritime heritage. 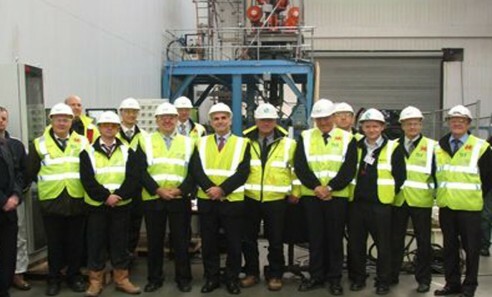 The contract, with a value of £6 million, is due for completion in 2010. As a result of de-commissioning requirements at Trawsfynydd Power Station, a contract has been awarded to Qualter Hall for the mechanical and electro-hydraulic equipment required to recover the intermediate level radioactive waste from the storage cells of the North Fuel Element Debris (FED) Vault. The equipment comprises of two machines purpose designed for the retrieval of waste from the storage cells and reliable transfer to the process cell in a safe and effective manner. The Waste Retrieval Machine (WRM) is an eight function robot generally comprising of an upper vertical telescopic jib and a lower pivoting extendable arm at the end of which is mounted a powered grab unit. The Waste Transfer Machine (WTM) comprises of a traversing frame on which is mounted a horizontal telescopic jib. On the end of the jib a 50 kg skip is located for the purpose of receiving the waste from the WRM grab and by rotating through 180° depositing the waste at the sort cell. Visit to Qualter Hall works by Mr Phil Sprague, the Magnox Director responsible for Trawsfynydd Power Station, along with the station's Project Team and Trawsfynydd Strategic Integrated Framework (TSIF) Staff. The visit was to inspect the assembled system and to witness a series of integrated tests which were successfully demonstrated to the visiting team. Powerfuel Mining Ltd awarded a major contract to Qualter Hall in April 2009 for the design, supply, manufacture and installation of a Tower Mounted Friction Winding System, which uprates and increases the winding capacity of the existing No1 Shaft Skip Winding System at Hatfield Colliery. The programme of works spans a three year period and sees the company returning to its core roots of winding and shaft technology. The Dartford Creek Barrier is a flood protection structure serving the area around Dartford. Refurbishment of the barrier is to be completed in 2010 and Qualter Hall's scope covers the replacement of the mechanical and hydraulic drives, hydraulic latch system, electrical and control systems. The work is for the Environment Agency and is subcontracted to Qualter Hall via the Main Contractor - Birse Civils Ltd.
As part of a long established relationship with the rail transportation division of global transportation company, Bombardier, Qualter Hall has been commissioned to manufacture numerous railway rolling stock steel components including cab ends, intermediate ends, bolsters and longitudes for Bombardier's Electrostar train projects for operation on the East London Line, North London Line, Southern, Stansted Express, Gautrain South Africa and their Turbostar train projects for operation on London Midland, London Overground and Chiltern Railways. Qualter Hall's new Ships Presses/Heavy Metal Forming Machines Division (Hugh Smith Engineering) were successful in winning against international competition the order from Qatar Petroleum for the design, manufacture, delivery to site, assembly, installation, testing and commissioning of six large plate and section forming machines, including both new and refurbished machines of various specifications, for the Nakilat Ship Repair Yard, Ras Laffan, Qatar. The order is worth over £4.8 million and is due for completion early 2010. The shipyard, which is being built on reclaimed land, is part of the massive expansion of the Port of Ras Laffan in Qatar and it is set to become a centre of excellence for the repair and maintenance of very large LNG carriers and a wide range of other vessels. 'Over the last 6 years, we have strategically and carefully invested over £6 million in our company through extending our facilities, acquiring a Ships Press business and uprating our machinery and technology. This has been a conscious, strategic decision in order that we remain competitive, particularly with increased competition from overseas. We are clearly delighted that this investment is paying off. It is of great credit to all of our staff, that they have adapted to and enhanced these changes with flexibility and ingenuity.